So how is this working out for people? Good, bad, boring (zzz...)? If new, check out the Cards Available for Trade links on the right navbar and read the Guidelines. Just curious for a little feedback. 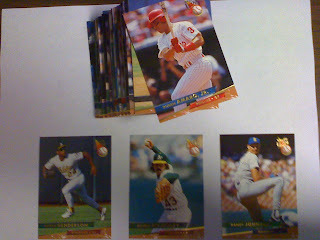 However, I do need to post some custom Topps Cards That Never Were and post a Padres All-Time Awful Starters (Thanks N.O. for the idea!). My Take: Again, I never actively collected these cards and must have ended up with them when I was buying 3,000 count boxes unseen for $5 a pop. Mysteriously cards from 1 through 80 are missing, so they must be in another box. Guess I will have to do a revisit trade on this one when I find them. Cards are nice. I like these much more than 92 Ultra because the backs do not have that bizzare crossword box feel. If you find 50, 51, 52 or 58 of the Dodgers, I'll take them. Any post where you're offering free cards is a good one! Now, now, now. I do want something in return, Night Owl. Maybe not much, but at least a couple of cards in return. i'm not sure if i need any dodgers from this set or not, but i will say that i look forward to these posts. part of the fun is trying to beat night owl to the punch! of course, i also enjoy the 'cards that never were' posts as well. Oh, don't worry, you'll get cards. By "free" I mean I don't have to pay money for them. Doc, what Padres cards are you looking for email me. I have all kinds of extra Padres.